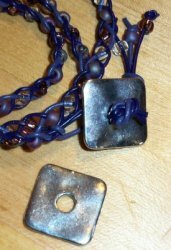 This is the single hole toggle bead that you've seen at my booth in bead shows and on the video tutorials. It's perfect for the leather wrap bracelet projects. Bag of 3.